Last month I shared with you guys my Tall Tapered Leg dresser, that I had built for our bedroom. 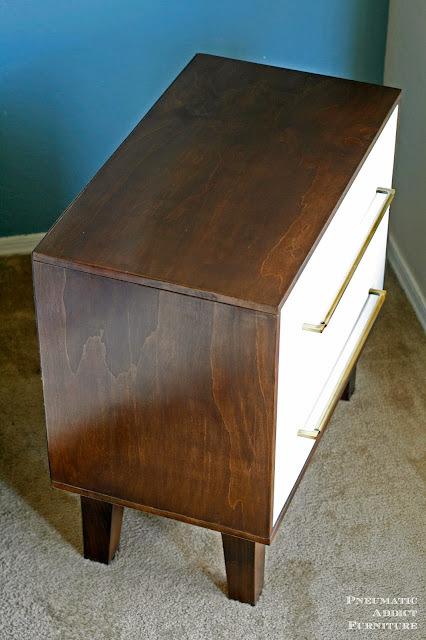 I wanted to build a pair of large nightstands that coordinated, but weren't too "matchy matchy". If you follow me of Instagram, you probably have seen the sneak peaks. 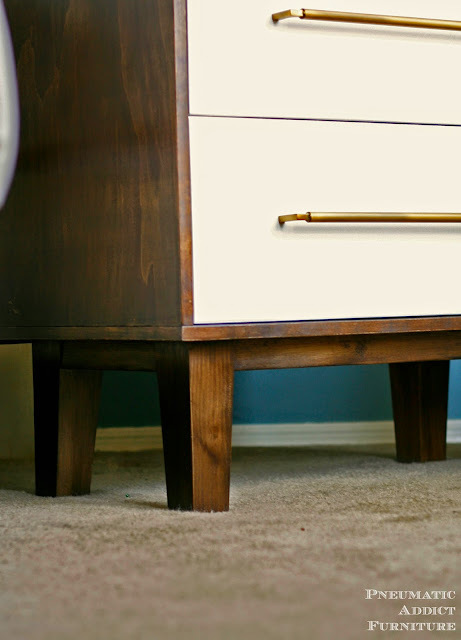 Using the same style of tapered bun feet from Osborne Wood Products , I sketched up a modern style bachelor's chest. (3) 1 x 8 x 96"
(1) 2 x 2 x 96"
(1) 1 x 2 x 72"
(2) 3/4" plywood - 16" x 28"
(2) 3/4" plywood - 16" x 18 7/8"
(2) 3/4" plywood - approx. 26" x 12 1/2"
(1) 1/8" hardboard - 28 1/4" x 20"
(1) 1 x 2 - 27"
(4) 1 x 8 - 14"
The build process is actually really easy on this project. It's basically a box with legs. After cutting all of your pieces (except those marked "approx. "), the next step is to apply edge banding to some of the plywood. For tips how to apply edge banding, check out my tutorial here. The largest two pieces of plywood need edge banding along both short and one long edge, and the smaller panels only need one of the 18 7/8" sides banded. Drill 3/4" pocket holes on both ends of each smaller panel. I drilled mine about 3 inches apart. Using 1 1/4" coarse pocket holes screws and wood glue, connect the side panels to the top and bottom, creating a box. 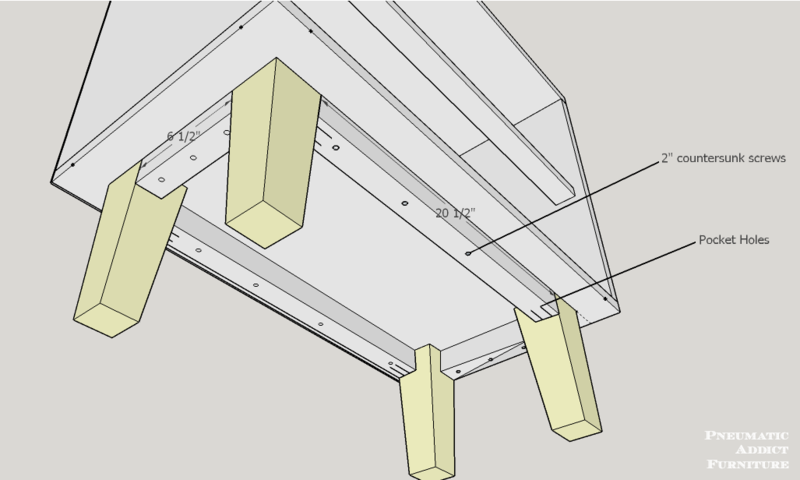 Make sure to orient your panels so all un-banded edges face the same direction. Check for square. 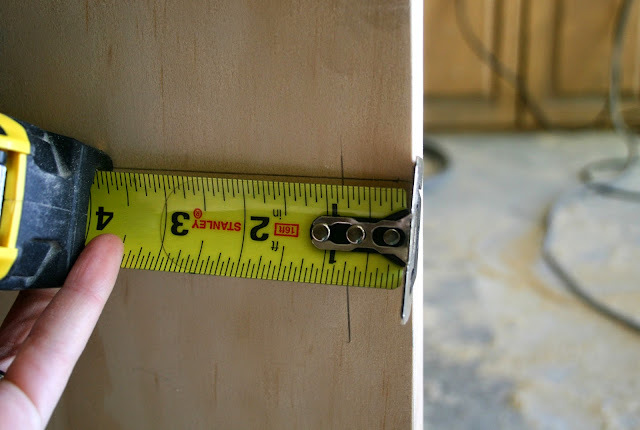 Attach 1/8" hardboard backer to the side of the box without vertical edge banding, using 1 1/4" wood screws. If your box is slightly out of square, you can use the backer board to pull it in the direction you need. 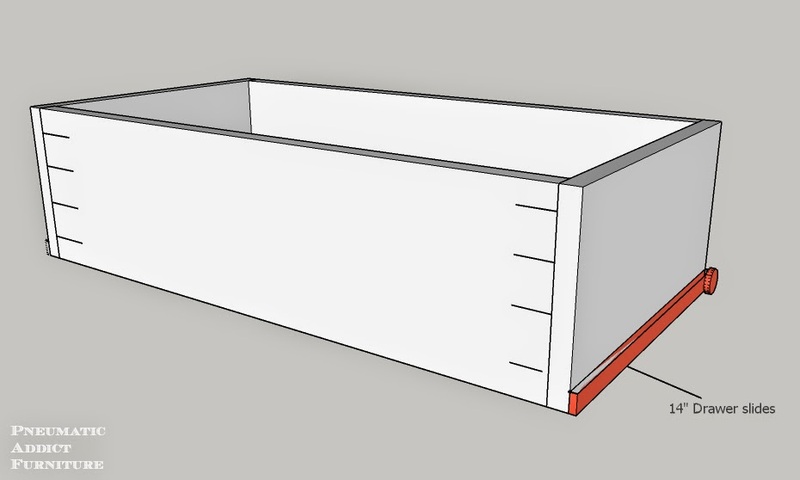 From the front edge of the box opening, measure 7/8" and ascribe a line. Measure veritcally from the bottom side of the top panel 9 1/16" and mark another line. Using pocket holes and wood glue, attach 1 x 2 underneath intersecting marks. Now it's time to cut the apron that will meet up with the feet. The tapered edge of the bun feet is at a 5 degree angle. 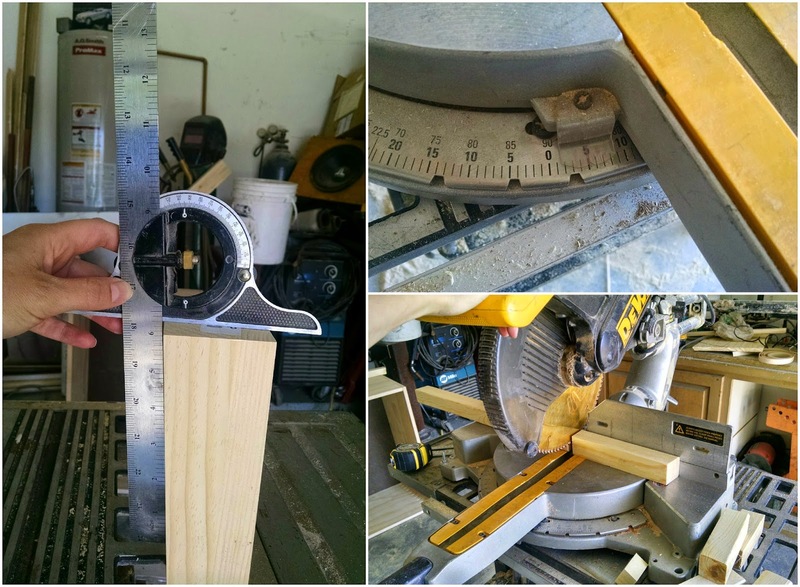 Set your saw to a 5 degree angle, and cut your 2 x 2. 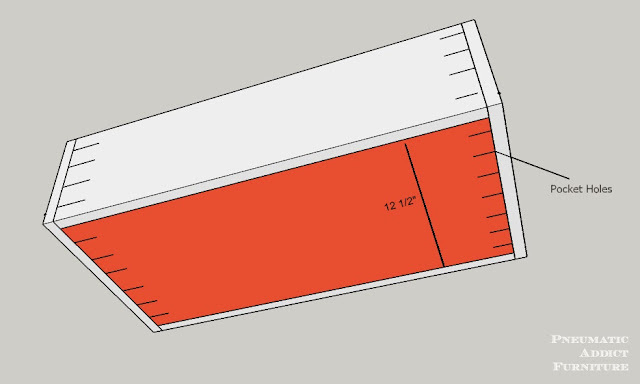 Flip the board over, measure from the long point of your freshly cut end. Mark your other long point, and cut. the piece will look like a trapezoid if cut correctly. Attach the long aprons between the tapered sides of two feet, flush with the top and outside edge, using 1 1/2" pocket holes and 2 1/2" pocket hole screws. Flip the chest box upside down. Place the bun feet and aprons on bottom of box. Make sure the 90 degree corner of each foot is pointing towards the outside corners of the box. Place shorter aprons between bun feet and hold pieces together tightly. Use bar clamps if you have them. Pre-drill holes through bottom side of aprons, about every 3-4 inches. 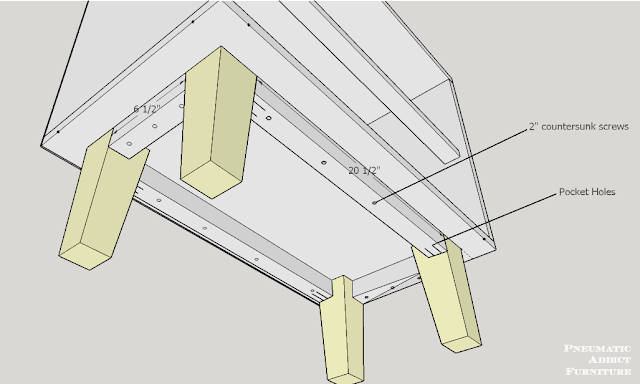 Secure all four pieces of apron to the bottom panel using glue and 2" wood screws. The main structure of the chest is done. Time to build the drawer boxes. 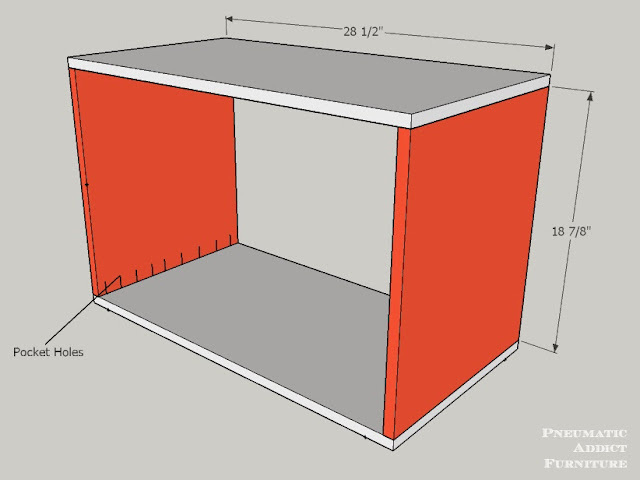 *VERY IMPORTANT: wait to cut the long sides and bottom panel of your drawer boxes until you have finished building the chest box. 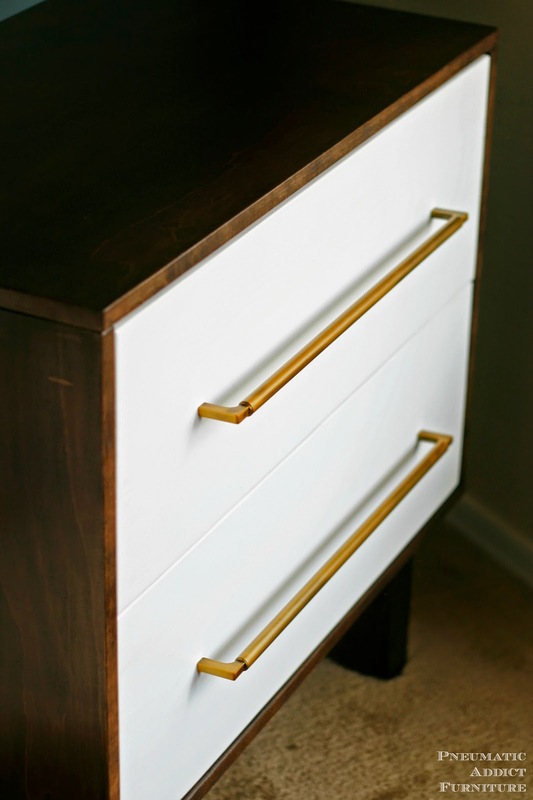 This is super important to make sure your drawers slide properly. 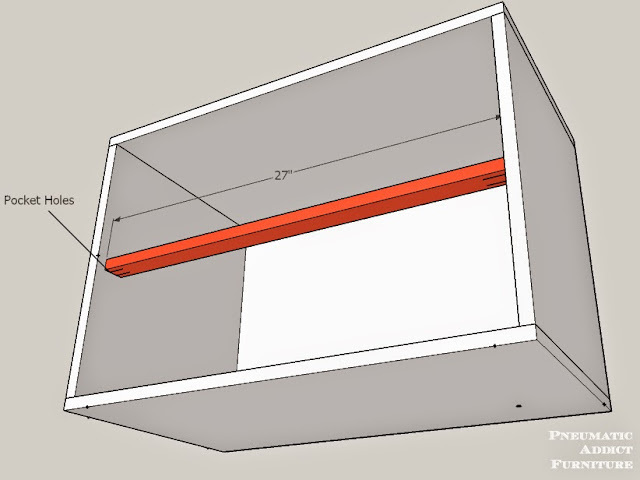 I highly recommend using this tutorial for installing your slides and finding your box ). width. 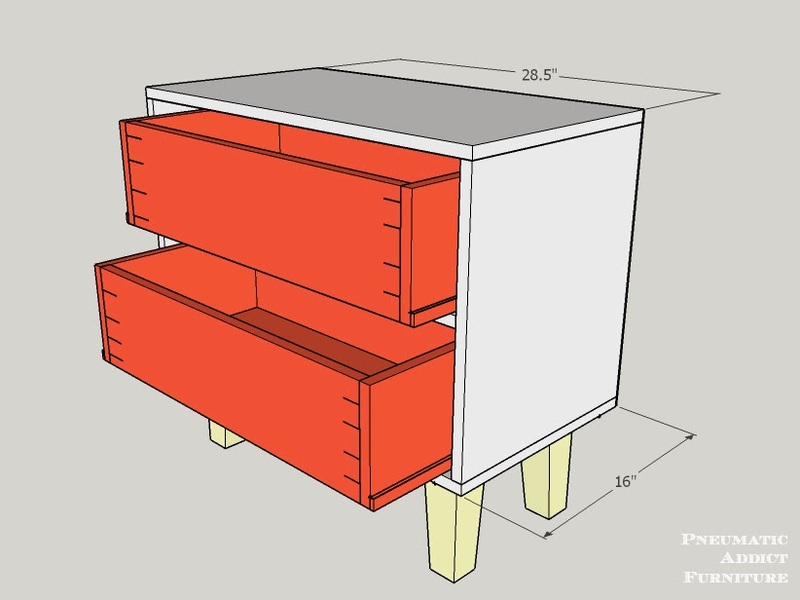 Once you have found the exact width your drawer boxes need to be, subtract 1 1/2" and cut two pieces of 1 x 8 to this length, for each drawer (each drawer box may be slightly different widths). Drill 4 pocket holes on each end of the longer boards. using screws and wood glue, attach a shorter board to each end, creating a box. Remember to face your pocket holes to the outside of the box. Attach bottom panel flush to the bottom side of the boards using wood glue and pocket hole screws. *You may find it easier to construct three side of the drawer box first, then add the bottom panel, and then the last side piece. 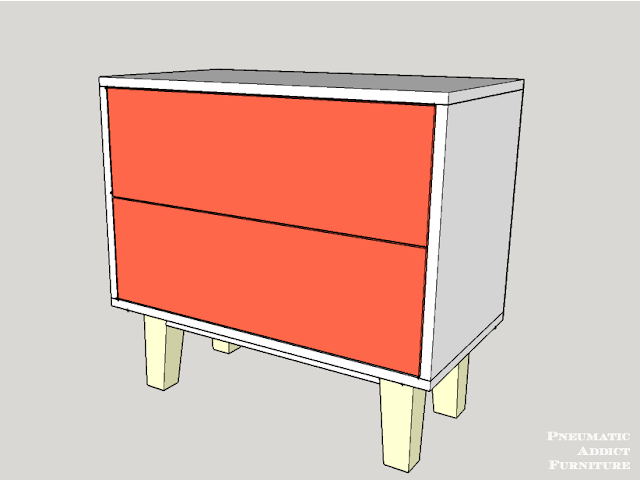 Attach drawer slides to the bottom of the drawer box. Slide the drawers in place. If the boxes are built properly, they should glide in and out with little effort. 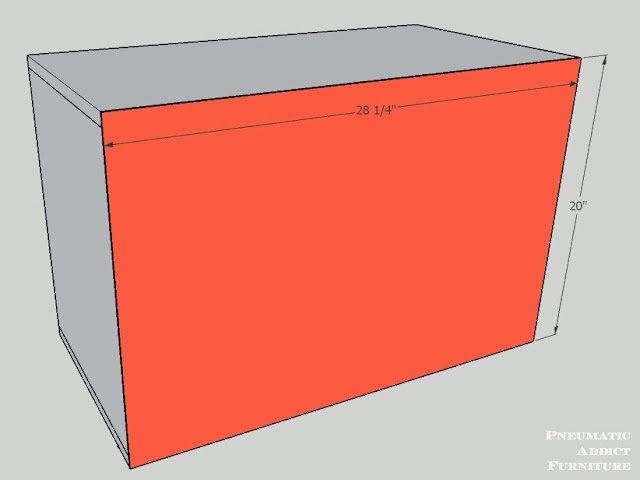 Measure the opening of the chest box and cut your 1 x 10 into two drawer faces. 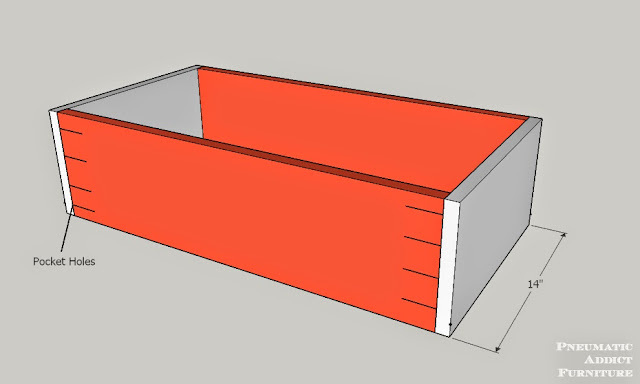 Make sure to leave 1/8" clearance around each edge. I find the easiest way to add drawer fronts is to use exterior mounting tape on the front of the drawer box and 1/8" shims along the bottom and sides of the drawer face. Press the drawer front onto the tape firmly, carefully open the drawer and from the inside of the box. drive four, 1 1/4" screws through pre-drilled holes. You're bachelor's chest is now done! Finish however you'd like, add your hardware and you're done. Here's how it turned out. I finished the chest box using my technique for getting an even finish on pine, and painted the drawer fronts a clean, bright white. Everything received 4 coats of satin lacquer to protect my hard work. How fabulous are those brass bar pulls?! The color is called "Sedona Bronze" and I found them at D.Lawless Hardware. I love how dramatic they are! Just about 18" long. They are part of the same collection as the knobs I put on my tall dresser. 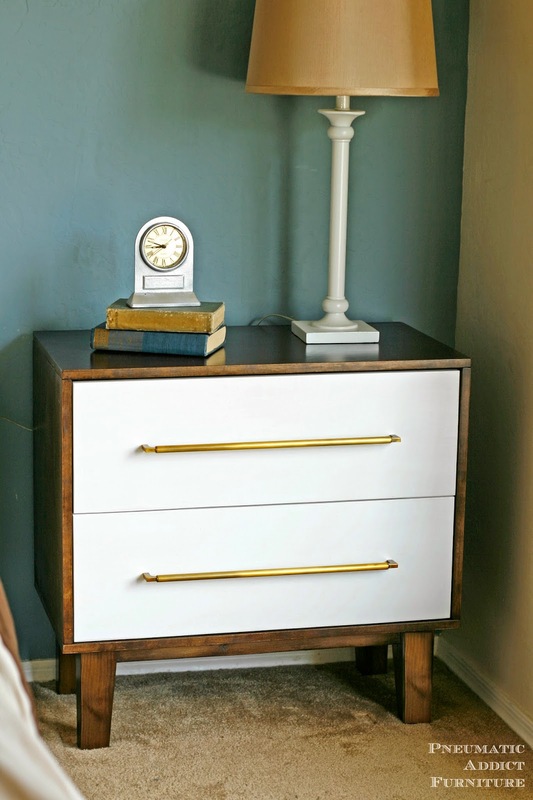 Another feature connecting these new nightstands to my dresser are the same sleek tapered bun feet from Osborne Wood Products. 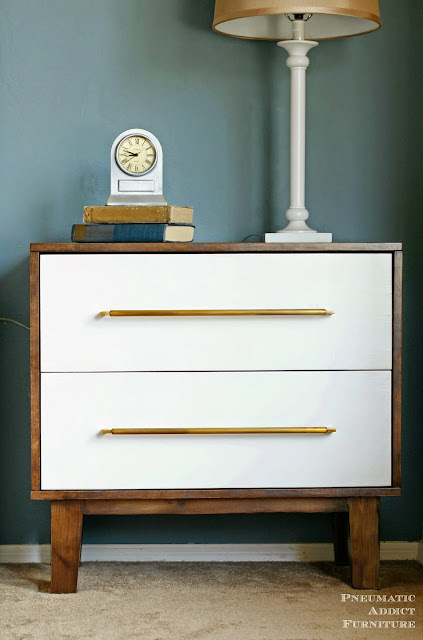 I'm currently falling in love with the mid century modern trend that is going on, but not ready to commit entirely. 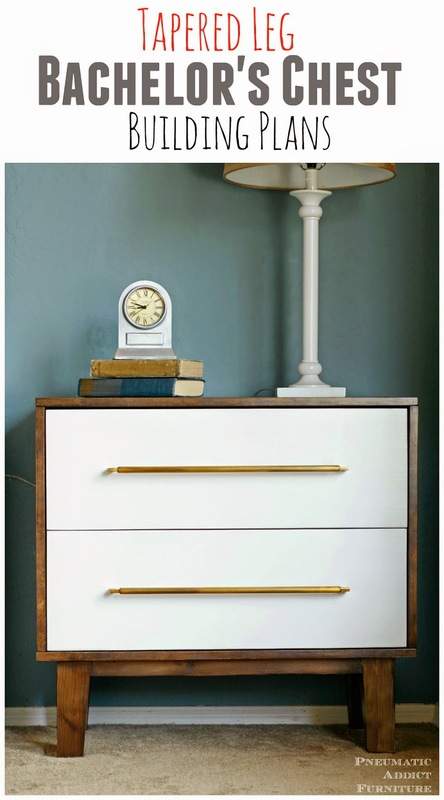 I think these little chest of drawers are a good mix of traditional and modern. What do you think? *The post contains affiliate links. I also received sponsored product from Osborne Wood Products. All opinions, and thoughts are entirely my own and have not been infuenced. It looks midcentury modern. Very nice! Thank you. Its not my husband's favorite style, but I'm happy with it. I think it turned out fabulous!!! I love the feet, and the pulls, and of course the flawless finish! Amazing Elisha, and worth all your hard work, the plans look amazing as well! Pinned! Haha. I'l get right on that! Thank you so much Karen! Beautiful finished product! Nice work! Girl... you KILLED this! Love it! The plan says 2 drawer slides, but don't you need 4? One to attach to each side of the two drawers? You are right, you will need 4 slides total. 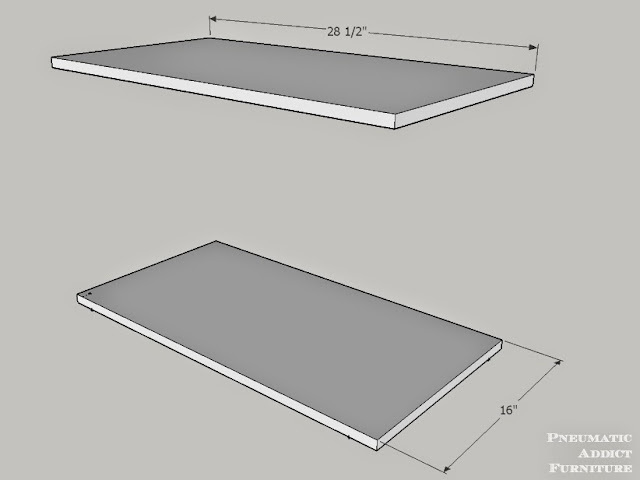 Drawer slides are typically sold in pairs, so I will edit the materials list to specify that you need to buy 2 pairs. Thanks for the heads up!